Erich Weber of Hofgut Falkenstein makes ultra-traditional, dry-tasting Saar Rieslings. He likes to call himself “Winzer Weber.” (Winzer is German for winegrower.) In other words, the emphasis is on the work in his vineyards, where he spends most of his days. With his tan and rugged face, he looks the part, too. Since his middle son, Johannes, has joined him full-time, there has been more of a focus on Rieslings with residual sugar. In recent years, their wines have also caught the attention of critics, both in and outside Germany. Erich and Johannes let ambient yeasts ferment the musts in old oak casks in a deep, cool, and damp cellar with moldy stone walls, and most of the wines end up either naturally dry (trocken) or off-dry (feinherb). Hofgut Falkenstein, therefore, is one of the rare Saar producers that specializes in distinctive, bracing, light, dry or dry-tasting Rieslings, bottled traditionally by the cask. The bone-dry Rieslings are brisk. All the wines have a ripe, racy, and well-integrated acidity from low yields and old vines. The key is a good grape. Hofgut Falkenstein has about 9 hectares planted in and around the village of Niedermennig. Like Erich, Johannes studied at Geisenheim. He also went to technical school and has taken on a bigger role in the cellar and vineyards. Erich's youngest son, Paul, and his eldest, Franz, also help out when they can, especially during the harvest. The vineyards, all in what is called Tälchen ("little valley"), are on various slate slopes in Falkensteiner Hofberg, Niedermenniger Herrenberg, Niedermenniger Sonnenberg, Krettnacher Euchariusberg, Krettnacher Altenberg, and Oberemmeler Karlsberg. Krettnacher Altenberg, formerly named Crettnacherberg, has a slightly cooler microclimate than Niedermenniger Herrenberg and mainly gray slate and quartz, plus a section closer to the village with diabase, a green basaltic rock, which is also found in Saarburger Rausch and in certain vineyards of Avelsbach, nearby Trier. The Webers have added a couple of choice plots in Krettnacher Altenberg, including a 0.2-ha parcel in the place-name Ober Schäfershaus, a top site by the church with gray slate, quartz, and diabase. The once renowned Euchariusberg—which, like the Scharzhofberg, historically had no village name attached—is relatively steep near the top of the original slope and looks like a mini-Scharzhofberg, with similar gray slate, along with quartz and harder quartzite-bearing sandstones. Over the years, the Webers have acquired several of the prime plots in Euchariusberg, also known as Großschock (Kruschock). These contiguous parcels, all on deep slate soils, are in the heart of the south-facing slope, which, at 5 ha, was the original sector and long considered one of the best sites on the Saar. The Webers now have a 2.2-ha block here. The main south-facing hillsides of Krettnacher Altenberg and Euchariusberg are two of the few top-ranked sites on the Saar (colored in dark red), as depicted on Franz Josef Clotten's Saar und Mosel Weinbau-Karte, a Prussian viticultural tax map, first printed in 1868. On Clotten's Viticultural Map of the Saar and Mosel, the core part of today's Niedermenniger Herrenberg was listed under the name "Zuckerberg"—which actually designates the eastern flank of this main hillside. The Webers also have well-placed old-vine parcels in the adjacent slopes of Niedermenniger Sonnenberg. One parcel in Kleinschock, which is a separate hillside, is labeled under the more site-specific cadastre name of Im Kleinschock. The Webers feel like this deserves a different designation. Besides Riesling, the Webers have some parcels of Pinot Blanc (Weissburgunder) and Pinot Noir (Spätburgunder), the latter one of the best examples on the Saar and Mosel. It’s a rare dry red wine in that it naturally doesn’t go through malolactic conversion and, like all their wines, is never chaptalized. Like the Weissburgunder, the red wine has—as one would expect—a mineral taste, lean texture, and wonderful bite. It reflects the Saar quite well. Erich's wife, Marita, who is from Niedermennig and is a great cook, likes to prepare home-cooked meals and loves to drink their Spätburgunder. During her studies near Stuttgart, in Württemberg, she enjoyed the local cuisine, as well as the Swabian reds for everyday drinking. The harvest is done in stages and all by hand, unlike some more famous VDP members with holdings here. For the most part, the Webers prefer en-bloc picking to making multiple passes through the same parcels. The small harvest team consists of family, friends, foreigners, and neighbors. Yields are small because of a relatively low-density planting and strict harvesting from old vines. Most importantly, the Webers believe in one flat cane per vine, no herbicides, no fertilizers, and little to no tillage. They do all the work themselves. The Webers drop the Riesling grapes whole via gravity—no pumping from a harvest trailer—onto a customized ramp and into a Slovenian-made NIKO pneumatic press. The grapes are gently pressed for two to three hours and the resulting juice flows via gravity into the cellar below for a natural sedimentation in Fuder overnight and then put into another cask, where the must ferments and later the wine stays on its gross lees until bottling in March, April, or May. All the wines are fermented by ambient yeasts. They don't use commercial enzymes, protein stabilizers, clarifying agents; nor do they chaptalize, concentrate, or de-acidify their wines. “Kontrolliertes nichts tun,” Erich says. In other words, they do as little as possible. The Webers only lightly sulfur the casks, before putting the grape musts into them. In addition, the various parcels are vinified separately in old oak Fuder. They once let Stefan Fobian, the former cellarmaster at Egon Müller, analyze the wines. Most important is that the pH value should be low, best under 3, to avoid any microbial spoilage, instability, and for aging the wines. “It’s the quintessence,” he says. He then knows that his wines are stable for maturation in cask. The slate soil of the Mosel region, along with parts of the Rhine regions, has naturally low pH values, thus high concentrations of acidity, though certain areas of the Saar, like Falkenstein, have an especially low pH. A few of the old Fuder casks come from a former mayor of Niedermennig, who was also a Küfer, or cooper, and received the best local oak from around the village. Erich still gets sentimental when he points out two smaller barrels, including a Halbfuder, that his late father made. Built into a hillside, the low-tech cellar is cool and damp with a healthy growth of molds on the walls and ceiling. Even though it’s becoming more and more outmoded (and for many good reasons), the Webers continue to label their dry and off-dry Rieslings with a Prädikat. The Mosel and especially the Saar have a long tradition, before today’s Prädikat system, of naturrein (“naturally pure”), or unchaptalized wines, that were more often dry. He wants to show this on the label for buyers. The trend now, led by the VDP, a leading association of German wine estates, is to keep the Prädikats only for the fruity and nobly sweet-style Rieslings. Top dry wines, such as the VDP’s Grosses Gewächs (GG), are now oddly listed under Qualitätswein, a quality wine that can be chaptalized or concentrated. The Webers like to bottle each Fuder separately, which is unheard of today, even though it was the standard in old times. Therefore, they can have two or more casks from the same vineyard site and with the same Prädikat. These don't have the same AP number, because they come from different parcels of the same site and were fermented, aged, and bottled separately. Because they neither chaptalize nor make a Gutsriesling (an entry-level Estate Riesling), various single-casks of Kabinett trocken are the starting point at Falkenstein. Grapes not deemed good enough are sold to the local co-op. Many longtime private clients drink Hofgut Falkenstein as their house wine. Erich personally delivers them their orders, zipping around in his car from one end of Germany to the other when he’s not in his vineyards from morning to evening. Weber wines are meant to be light and bekömmlich, or easily digestible. Erich, who studied viticulture in Geisenheim, began from scratch in 1981 and moved from nearby Krettnach to the then-dilapidated Falkensteinerhof in 1985. He fixed the building up himself. “It was a lot of hard work,” he says. In 1901, Falkenstein was established, along with the vineyard of "de Nysberg," by the Friedrich-Wilhelm-Gymnasium (FWG) in Trier, which still owns its original holdings on the large, contiguous Falkensteiner Hofberg (Falkenstein/de Nysberg). The FWG wine estate is now a part of Bischöfliche Weingüter Trier. The manor house was only completed in 1928. On a slope behind the press house, Erich and Marita have converted a part of their vineyard into a beautiful patio with terraced garden overlooking Konzer Tälchen, which runs from the town of Konz to Krettnach and was once an old branch of the Mosel River. The valley includes Oberemmel and Wiltingen, but neither is considered part of Tälchen. Erich says that the Abbey of Mettlach governed Oberemmel, whereas St. Matthias in Trier the area around Niedermennig and Krettnach. The packaging at Hofgut Falkenstein matches the wines, too, ribbed-paper labels and modest 330-mm Schlegel bottles in dark green, called massongrün. They had avoided capsules until a few vintages ago. The one wine that is bottled in magnum each vintage still has the paper strip over the top of the bottle with the words "Hofgut Falkenstein." 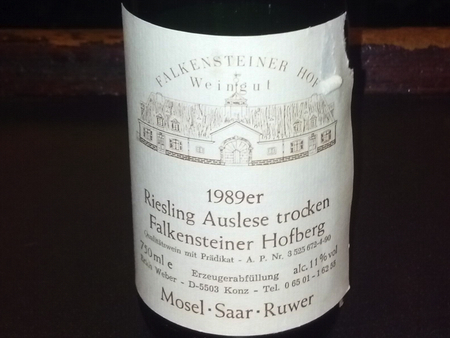 Old labels, before the early nineties, had the same look and design, except the title (above the logo) had the words "Falkensteiner Hof" with "Weingut" underneath, such as the 1989 Falkensteiner Hofberg Riesling Auslese trocken, courtesy of the wine critic David Schildknecht. 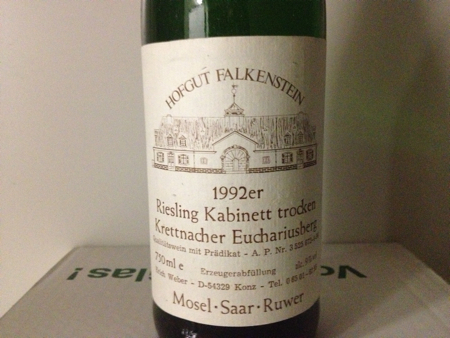 An excellent 1992 Krettnacher Euchariusberg Riesling Kabinett trocken looks the same. Since the 2015 vintage, they have an old-school font once again. And the Webers decided to put "Saar" and the AP botting number in bold print. The latter highlights their cask-by-cask bottlings, which is seldom done nowadays. In other words, each Fuder cask is bottled separately, instead of making blends among different casks. As mentioned above, all of their wines ferment naturally with ambient yeasts and stay on the lees until bottling, which starts in March or April. They don't rack, pump, and filter multiple times beforehand. In Uwe Kristen's Der Kellermeister, he writes "[the label] looks like it has been printed on an old ink-jet printer sitting on one of the large barrels." The Webers are one of the rare producers to bottle the wines without a contract bottler. They also avoid using a vacuum pump or an absolute cartridge membrane filter at bottling. The spritzy character of the wines comes from the natural residual carbon dioxide during fermentation and from the gentle handling, not from carbon dioxide that is injected by a device. The Webers make light, tangy, wholesome, dry-tasting Saar Rieslings, as well as some with more noticeable residual sugar. These old-style Saar wines often retain a lively, natural effervescence (spritzig) from fermentation and minimal handling. In other words, they go down well—Trinkfluss in German. The Spätlese trocken from Krettnacher Altenberg is usually the driest Riesling of the bunch—a wine for diehard Falkenstein fans, who like their Saar Riesling herb, or pleasantly astringent. The Krettnacher and the other dry wines have salinity and an umami taste. Even the Riesling Spätlese feinherb wines tend to be closer to dry than sweet, because of the acidity. Johannes is now making more wines from Euchariusberg with residual sugar that have the interplay of pure fruit and mineral-crystalline Saar acidity. But he still continues to make with his father the bread-and-butter dry wines. 2018: See "A Selection of 2018 Saar Rieslings from Hofgut Falkenstein." 2017: See "A Selection of 2017 Saar Rieslings from Hofgut Falkenstein." 2016: See "A Selection of 2016 Saar Rieslings from Hofgut Falkenstein." 2015: See "Update: Hofgut Falkenstein." 2014: It was another difficult vintage. The grapes needed to be properly sorted and picked before noon to keep them cool for the press house. For me, the top wine from cask was the 2014 Krettnacher Euchariusberg Auslese (AP 5) from the steep core south-facing part known as Großschock. This is a great wine. In the old days, the wines from this famous site were called simply Euchariusberger. I also really like the 2014 Niedermenniger Herrenberg Spätlese feinherb (AP 2), which comes primarily from a plot close to the property in a section known as Großwald. Among the dry Rieslings, my favorites are the lean 2014 Niedermenniger Sonnenberg Spätlese trocken and the 2014 Herrenberg Kabinett trocken, the latter of which is from a parcel called Mutta Anna. 2013: Despite the difficult 2013 vintage, which Erich calls the hardest growing season and harvest of his career, he made pure and fine Saar wines. On August 26, 2014, I visited Hofgut Falkenstein to taste the entire collection of 2013 Rieslings in bottle. Before we tasted the wines, we did a little vineyard tour. Erich showed us all the sites, including his old-vine parcel in Krettnacher Altenberg. This lies more in the side valley on a south-facing slope and was his very first holding. It belonged to his mother. He owns a second parcel on flatter ground near the road between Krettnach and Obermennig. Johannes has acquired an extra parcel below their old-vine plot. The Webers bottled two 2013 Niedermenniger Herrenberg Riesling Kabinett trocken. The first bottling (AP 1) comes from two old-vine plots. The second bottling comes from a plot above von Kesselstatt's vineyard. Half of the Fuder has been used to make the base wine for their sparkling wine. The rest was bottled as Kabinett and mostly sold to private clients without a label. And, by the way, none of their wines were de-acidified. The acidity is quite high (often over 10 grams per liter), but the acids are ripe. They only bottled one cask of 2013 Krettnacher Altenberg Riesling Spätlese trocken. This has a marked saline character and, like all the dry wines, has between 4 and 6 grams of sugar per liter. The 2013 Niedermenniger Sonnenberg Riesling Spätlese trocken is more fruity and a delight. They also have a 2013 Sonnenberg Riesling Spätlese feinherb, which is still rather reduced on the nose. Erich and Johannes decided two blend two casks for making their 2013 Niedermenniger Herrenberg Spätlese feinherb (AP 3). It's quite zippy and comes from parcels in Zuckerberg. They bottled the third cask of 2013 Herrenberg Spätlese feinherb that comes from old vines in a parcel below von Kesselstatt's, known as "Deutschen." This has a little more finesse than the first bottling and has been sold unlabeled to a few private clients in Hamburg. The Webers also bottled a 2013 Falkensteiner Hofberg Riesling Spätlese and a 2013 Krettacher Euchariusberg Auslese. The latter is always one of their top wines. The 2013 Hofberg Spätlese has the typical grassy, herbal notes and tastes quite balanced, despite 70-plus grams of residual sugar. One of the surprise wines was a 2013 Spätburgunder rosé. I also really liked the 2012 Niedermenniger Herrenberg Spätburgunder, along with the 2013 Herrenberg Weissburgunder. On March 21, 2014, I tasted cask samples once again. Erich would like to keep the 2013 Rieslings a little longer on the gross lees before bottling. The two casks of Niedermenniger Herrenberg Kabinett trocken are from different parcels. Fuder number 2 comes from mainly 60-to-80-year-old vines, which, Erich says, has more blue slate (a part of which will be the base wine for Sekt), whereas Fuder number 1 is old vines from more red slate. Number 2 tastes a little more austere, which would be typical of blue slate. Both are fine wines. The old-vine parcel of 2013 Krettnacher Altenberg Spätlese trocken is salty and has a long aftertaste. This tastes different from the 2013 Niedermenniger Sonnenberg Spätlese trocken, which has more of a fruity, smoky character. We also tasted the two different casks of 2013 Niedermenniger Herrenberg Rieslings, which will be blended to make the Spätlese feinherb. The first cask is drier and quite impressive. The second one is still cloudy and reduced, with a sweeter taste. It needs to ferment more. We also tasted casks of Falkensteiner Hofberg Spätlese and Krettnacher Euchariusberg Auslese. Both have over 70 grams of residual sugar, but taste more off-dry than sweet. The surprise wine of the tasting was a cask of 2013 Niedermenniger Herrenberg Spätlese feinherb "Alte Reben," or "old vines." In fact, this off-dry Saar Riesling, which has about 88 degrees Oechsle, comes mainly from a parcel of 80-year-old vines in "Deutschen" and will be bottled for a few die-hard private clients of Falkenstein (AP 12) in Hamburg. Erich probably won't even label all the bottles and few people will have tasted it. On February 6, 2014, I re-tasted the casks of 2013 Riesling, before my trip to Central Texas and NYC. The Webers have two separate Fuder of Herrenberg Kabinett trocken. I found them both very good. They've only one cask of Krettnacher Altenberg Spätlese trocken this vintage, which tastes typical Altenberg, with a marked salty character. The plot of old vines is on a gradual slope. The two casks of Herrenberg Spätlese will be blended together to make one wine. One Fuder fermented naturally dry and was quite impressive, the other is from a parcel called "Ilse." It's still fermenting and is a lighter and sweeter wine, with about 30 grams of sugar. The Webers could bottle this second cask as a fruity Kabinett. Yet this will make an excellent part of a blend. The Webers have two casks of Euchariusberg. One is primarily from the parcel called Arthuro and has 98 degrees Oechsle. They also have one cask of Falkensteiner Hofberg. These are all quite delicious. Some favorites: I really like the lean, dry 2013 Niedermenniger Herrenberg Weissburgunder Spätlese trocken ♥, the tangy 2013 Niedermenniger Sonnenberg Riesling Spätlese trocken ♥, and the spritzy 2013 Niedermenniger Herrenberg Riesling Spätlese feinherb ♥ (AP 3), which is a rare blend of two casks. The one Fuder had fermented dry, the other had more residual sugar and volatile sulfur compounds on the nose, which has dissipated. This off-dry bottling has about 23 grams of sugar. The second and so-called Alte Reben bottling is the third cask of 2013 Herrenberg Riesling Spätlese feinherb. Johannes says that it's a little lighter in alcohol and a little higher in residual sugar than the first bottling. The 2013 Niedermenniger Herrenberg Riesling Kabinett trocken ♥ (AP 1) is salty, crystalline, and goes down well. It's the first bottling of the vintage. The second cask of 2013 Herrenberg Riesling Kabinett trocken might even be better. A late bloomer is the 2013 Niedermenniger Sonnenberg Riesling Spätlese feinherb ♥ (AP 8), which early on was a little stinky, but now it's one of my favorites. It has a pale yellow color and impressive tension, while remaining light and delicious. 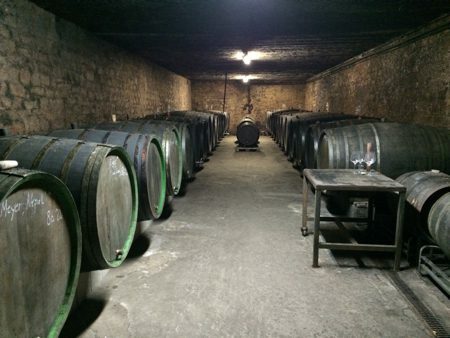 In July 2014, the Webers bottled their cask of 2013 Falkensteiner Hofberg Riesling Spätlese and a Fuder of 2012 Niedermenniger Herrenberg Spätburgunder Spätlese trocken. Both tasted very good. Johannes decided to designate the Hofberg as Spätlese this vintage. 2012: On February 9, 2013, I tasted cask samples of Falkenstein's 2012 Saar Rieslings. The Webers' 2011s are all but sold out. They will begin bottling some of their 2012s in late March, early April. We first tasted a Fuder, designated "Ilse," of dry Riesling with about 86 degrees Oechsle, which will be their first Kabinett in several years. This was quite brisk and delicious. Most of their wines have finished fermentation and are all on the gross lees. In the corner, the next Fuder, called "Schilly," had about 87 degrees Oechsle. The Webers write in chalk different names on each cask. In most instances, the names refer to the former landowner of a specific parcel of vines. Each cask is bottled separately. We also tasted several Fuder from Euchariusberg, where they have added some extra old-vine plots to their holdings. The different casks of wine from this vineyard were all at about 95 degrees Oechsle and will be labeled as Auslese. The Euchariusberg wines naturally stop fermenting on their own with some residual sugar leftover. There will be several different bottlings from each site. The 2012 Kabinett trocken will come from Niedermenniger Herrenberg, like 2008. They will also have 2012 Spätlese trocken from Krettnacher Altenberg and Niedermenniger Sonnenberg. The former is more firm—classic Altenberg. It's not for everyone. The Webers also have another impressive Herrenberg Spätlese feinherb. 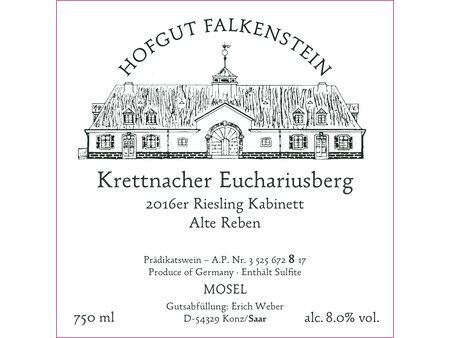 The Fuder of Falkensteiner Hofberg and various casks of Krettnacher Euchariusberg will be bottled as Riesling Auslese, though one cask of Euchariusberg has a little less ripeness and will most likely be bottled as a Spätlese feinherb. We tasted an excellent, mineral, and taut 2011 Spätburgunder from Herrenberg, too. So far, Erich says that 2012 vintage looks promising. The late flowering means smaller grapes. He adds, "old vines are a mystery." Before the 2012 harvest got underway, Erich and Johannes used a high-pressure cleaner with water to remove the mold from the cellar walls. Erich last cleaned them over 20 years ago. The mold was fine, but they didn't want to scare too many customers away. Some favorites: It won't be for everyone, but the 2012 Niedermenniger Herrenberg Riesling Kabinett trocken ♥ is taut and mineral, but such a delight. I drank an entire bottle at home last night (May 5). This was the first cask of the Herrenberg Kabinett trocken. The Webers have yet to bottle the second cask of this wine. The 2012 Krettnacher Altenberg Riesling Spätlese trocken ♥ can be stahlig, or steely, as well as rustic, and needs time to open up, but it's been my go-to wine from vintage to vintage. Other favorites this vintage include the very fine 2012 Niedermenniger Herrenberg Riesling Spätlese feinherb ♥♥ and the 2012 Niedermenniger Sonnenberg Riesling Spätlese feinherb ♥. 2011: I had cask samples of 2011. Erich began bottling a few of his 2011 Rieslings at the end of March 2012. I first tasted some samples from Fuder several months ago. He harvested Riesling between 85 and 110 degrees Oechsle; acidity is very good at 8 to 11 grams per liter. Erich initially wanted to vinify an old-style "Tischwein" (table wine) for quaffing this vintage and label the wine as Kabinett trocken. It would have been his first in many years. He has already bottled three 2011s: Krettnacher Altenberg Riesling Spätlese trocken, Niedermenniger Herrenberg Riesling Spätlese feinherb "Fuder 3” (AP 2)—from the foot of the slope and with about 15 grams of residual sugar (RS)—and Krettnacher Euchariusberg Riesling Auslese. The Altenberg Spätlese trocken is classic Falkenstein. In 2011, this section of Altenberg was bottled first with the AP 1. Erich has another dry-fermented Altenberg that's in Fuder. It's somewhat softer if you can say that about Falkenstein. (As of November 2012, a third cask has yet to be bottled. It's lighter in style. He also bottled a very good Altenberg Riesling Spätlese feinherb.) In addition, he has a drier Herrenberg Spätlese feinherb still in cask. The Auslese from Euchariusberg had perfect gold-yellow grapes harvested just before noble rot set in and has 50 grams of sugar per liter with 10.7 g/l acidity. "Euchariusberg," Erich's son Johannes says, "is ideal for Auslese." Before the high-sugar levels in the 1999 vintage, most of Falkenstein's Saar Rieslings fermented bone-dry. The 2011 Niedermenniger Sonnenberg Riesling Spätlese trocken, which is still in Fuder, has about 3 grams of sugar. The grapes were harvested at 90 degrees Oechsle from a parcel called "Muny," with 80-year-old vines. Also in cask is the 2011 Niedermenniger Herrenberg Riesling Spätlese trocken. This has more schmelz, or glaze, and about 10 grams of sugar per liter. As with the 2010 vintage, the 2011 Falkensteiner Hofberg Riesling Auslese has a distinct grassy, herbal note. It's gulpable. Johannes aged the 2010 Hofberg Riesling Auslese in a separate cellar and bottled it in an 350-mm antique-green Schlegelflasche topped with a screwcap. The 2011 was vinified in the main cellar and has the old, standard look in the shorter massongrün bottle with a natural cork closure. Their plot of old vines (0.30 ha) in Hofberg is located on a knoll below and to the right of the cellar. Erich Weber also has Riesling Sekt, or sparkling wine, made in the traditional manner with the second fermentation in bottle, called Flaschengärung. A 2009 brut was most delicious when tasted in July 2012. His terroir and grapes are ideal for Sekt production, as was the tradition on the Saar in the latter half of the 19th century. Some favorites: An early favorite is 2011 Krettnacher Altenberg Riesling Spätlese trocken ♥ (AP 1). It's less austere than the 2010 bottlings from this vineyard site, but still has a slightly sparkling taste with good tension and a saline aftertaste. The Webers have three Fuder casks of this wine, each bottled separately under the same AP number. One cask has yet to be bottled as of October 2012 and is quite light, fine, and briny. In general, Altenberg needs a little time to open up. Initially, it can be a little tart. A vin de soif, or a wine for gulping down, is the 2011 Niedermenniger Sonnenberg Riesling Spätlese trocken ♥. It's juicy, with citrus and grapefruit notes. The 2011 Niedermenniger Herrenberg Riesling Spätlese feinherb ♥♥ (AP 6) is bright (8.5 g/l acidity) and very fine. On Falkenstein's price list, it's designated as "Fuder 5." It comes from a parcel higher up the slope that formerly belonged to von Kesselstatt. This plot once had low dry stone terraces. The 2011 Niedermenniger Euchariusberg Riesling Auslese ♥♥ is crisp and for drinking. Also, a fresh, light, and piquant 2011 Niedermenniger Herrenberg Spätburgunder Spätlese trocken ♥. 2010: Last year, Weber heeded my advice and put his 2010 Spätburgunder—no chaptalization, no malo—into a plain Burgundy bottle. He had formerly used a high-shoulder Bordeaux-style bottle. The 2010 Niedermenniger Sonnenberg Spätburgunder Kabinett trocken is a bracing wine and already sold out. Like his Rieslings, his Pinot Noirs are not for everyone. Although you have to love a grower who still labels a wine "Kabinett trocken," much less a Pinot Noir from the Saar. Admittedly the nomenclature is outdated—both the actual minimum must weight and the Prädikat. The trend today, led by the VDP, is to leave off Prädikat designations except for fruity and nobly sweet Rieslings. The Spätburgunder is picked in small crates and then brought to the press house, where the Webers put a layer of grapes in whole bunches at the bottom of the vat and use to put the rest through a crusher-destemmer. There is no destemming and only foot-treading now. The bottom layer then goes through a semi-carbonic maceration. Most of the grapes, however, macerate traditionally on the skins for a period of time before going into either old wooden Fuder casks or smaller used barrels. For those who believe that red wines have no tradition on the Mosel, think again. Reds are indeed traditional, despite playing a minor role. On the Saar, the village of Könen was once well known for its Pinot Noir from Schabberg and Nonnenberg. Some favorites: The 2010 Niedermenniger Herrenberg Riesling Spätlese ♥ was delicious upon release last spring but sold out quickly. Despite no taste profile, like trocken, on the label, it had only 9.5 grams of sugar per liter, hence legally dry with the new tolerance limit of 10 grams. The first bottling (AP 1) of 2010 Krettnacher Altenberg Riesling Spätlese trocken ♥ is briny and pure. Although lightly effervescent (spritzig) at first, it gains a savory and subtle creaminess. The last and third bottling (AP 7) from another Fuder of 2010 Krettnacher Altenberg Riesling Spätlese trocken ♥ has a fresh, salty flavor with bright acidity. "It's fresh, racy, and pure," Erich says. It comes from an old-vine plot on the slope. These are old-style Saar wines. If you give them some time and an open mind, they might sneak up on you.